If it's been a while since you truly examined what you're offering residents to help them live well, this simple tool is a good place to start. What percentage of your residents participate in the various programs and events offered at your community? How many programs on your calendar are active versus passive? 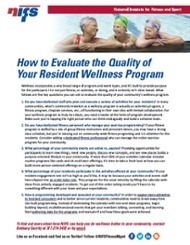 In addition to offering you benchmarking information with each question that will help you formulate your strategy for doing wellness better, you'll get links to other pieces we've written to help broaden your view on what may be possible with your space, your staff and your residents. If those resources sound like just what you need to start building a robust wellness strategy in your community, fill out the form to download the quick read.